A variety of retailers across Europe tell us that this M800 will feature Pelikan’s standard gold-plated furniture including a single trim ring at the section, two trim rings at the piston knob, two cap bands, a plated cap top with a single chick logo, and the iconic pelicans beak clip. The section, piston knob, and cap are done in a dark blue resin which beautifully compliments the blue and brown marbling effect on the cellulose-acetate barrel. There does not appear to be a discrete ink window and only time will tell if there is any translucency to the design for gauging ink levels. The nib will be Pelikan’s familiar two-toned 18C-750 gold available in EF, F, M, and B widths. The M800 is a larger pen coming in at 5.59 inches when capped, 6.46 inches when posted, with a diameter of 0.52 inches, and a weight of 0.99 ounces. The quoted ink capacity for this model is 1.35mL. This is a special edition release meaning production will be limited. If you’ve been waiting for the right pen to come along and aren’t put off by a bigger writing instrument, this may be the one you’ve been waiting for. In addition to the fountain pen, there also appears to be a matching K800 ballpoint pen available. No word yet on the US MSRP. While prices will vary somewhat between regions and vendors, I’d expect the fountain pen to go for somewhere around €437.19 (~$509.84) for US customers shopping overseas when the VAT is excluded. 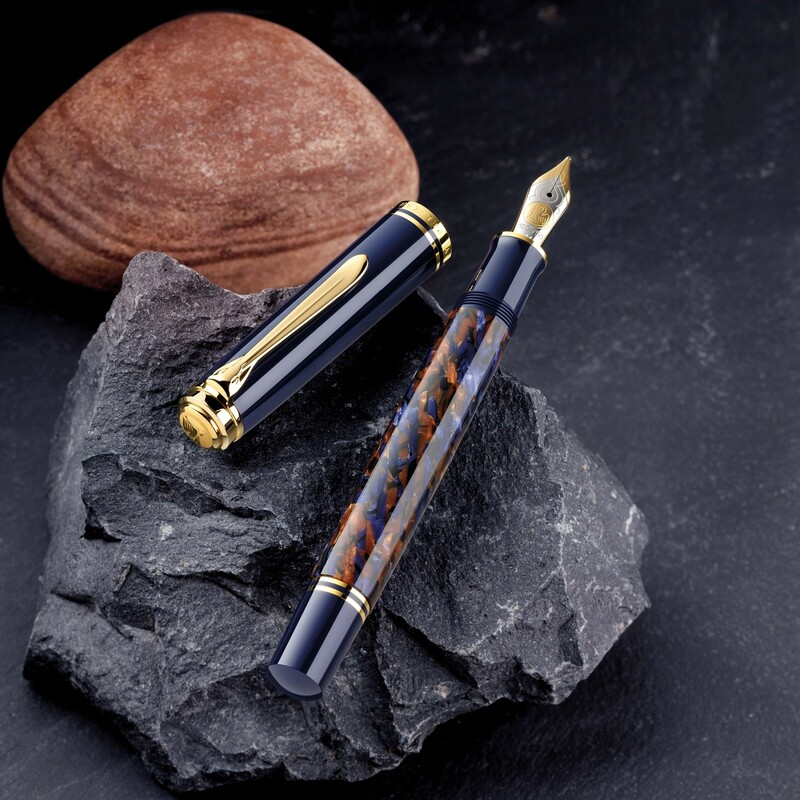 The ballpoint will likely be in the neighborhood of €300 (~$349.86). That would be consistent with past releases and, while expensive, is not off the charts. Keep in mind, if you want an EF nib and are shopping from an EU vendor, you will pay a small additional premium. Your preferred retailer should be taking pre-orders soon. In my personal opinion, if the actual product lives up to the pre-release photos depicted here, then this may well be the best looking release out of Hannover this year. If you look closely a the photos, it almost looks as if Pelikan took their standard striped pattern and twisted it around the barrel creating this interesting marbled effect. I know many will be disappointed to see another large pen with an awesome finish but fret not. If rumors are to be believed, the M600 line should get its own new addition before the year is out and it’s no slouch. What are your thoughts on the Stone Garden M800 and will you be picking one up? Breathtaking. Thanks for the picture, and this news. I think that’s an excellent description for this one. Breathtaking indeed. Thank you Joshua. This is not what I had imagined, but it is a beautiful pen just the same. Fritz says “blue resin” in his post… do you know if the section, knob, and cap are blue resin or black? So hard to tell from the promo shots. And yes, I will be grabbing one, although not sure from which vendor yet. The resin of the piston knob, cap, and section is dark blue and looks great in that hue. Thanks! That will stand out in the nest box. Always room in the flock for another. I look at it from a different angle. Can you be happy with your flock knowing that you missed out on this one? No regrets. Definitely a ‘must have’. It looks as much of a stunner as the Renaissance Brown, and the idea of combining dark blue for the cap and piston knob with the gorgeous stone garden colouring is a stroke of genius. It’s the dark blue resin that has me really buying in. I just hope that the pen delivers on the promise in real life. Thank you Joshua, I’d no idea of another release so soon after Platinum. Will my bank balance accommodate yet another purchase – it’ll have to! Incidentally, despite the £/€ exchange rate, I can wholeheartedly recommend Penworld in Antwerp- not sure how prices work if they shipped to US. Penworld is a great vendor. I wish Pelikan would release some stinkers so I could put my wallet away. I will not be purchasing this pen mostly because I think an M800 would be too big for my hands. That being said, it’s a lovely looking pen and I just LOVE the dark blue resin though I’m not crazy about the blue/brown marbling. I would love an M600 with the blue resin but with a different main color. Thanks for keeping us on top of all the new releases. You’re welcome. Maybe the next M6xx will be more to your taste. I get the ‘soothing’ vibe, I think, but do stone gardens typically include blue stones…? Love it. This garden gets more calming by the minute. Haha. I guess you just have to use your imagination. Seems like it will be “fairly” reasonably priced. It’s a beauty! It’s looking like $405-425 is the best price for those shopping from outside of the EU. Can’t get much of a better price than that for an M8xx these days. Sounds like the upcoming M600 may be more to your liking then. I hear that it’s a splash of color for a refreshing change. I look forward to it, whatever it is. My tongue was firmly in cheek above (hence the ;)). I figured as much but you aren’t far off the mark. Would it kill Pelikan to add a splash of color here and there. Even when daring, they remain on the subdued side. Some of their best releases have been vibrant and colorful. Wow – I agree with you, Joshua, this is the best release this year. This is a really beautiful pen – great for those of us for whom the M800 is just the right size – but unfortunately for many it’s a bit big. Thinking about it! I feel for those that keep getting left behind by some great finishes due to size. I’m very fortunate/cursed that just about any sized Pelikan fits my hand fairly comfortably. Also, LcDc is offering a coupon code STONEGARDEN20 for 20% off. If in the US, final price is $422. I think you’re right to reserve judgement until we see some more pics. I too was a bit plus/minus on the Renaissance Brown but it definitely has a beauty that’s easy to appreciate. Hopefully this will prove similar. Thank you for another great article and nice pictures! I had not planned to get another M800 but this one makes me uncertain. Quite beautiful. You’re welcome. Pelikan has a way of getting you to buy a new pen when you had no intention of doing so. 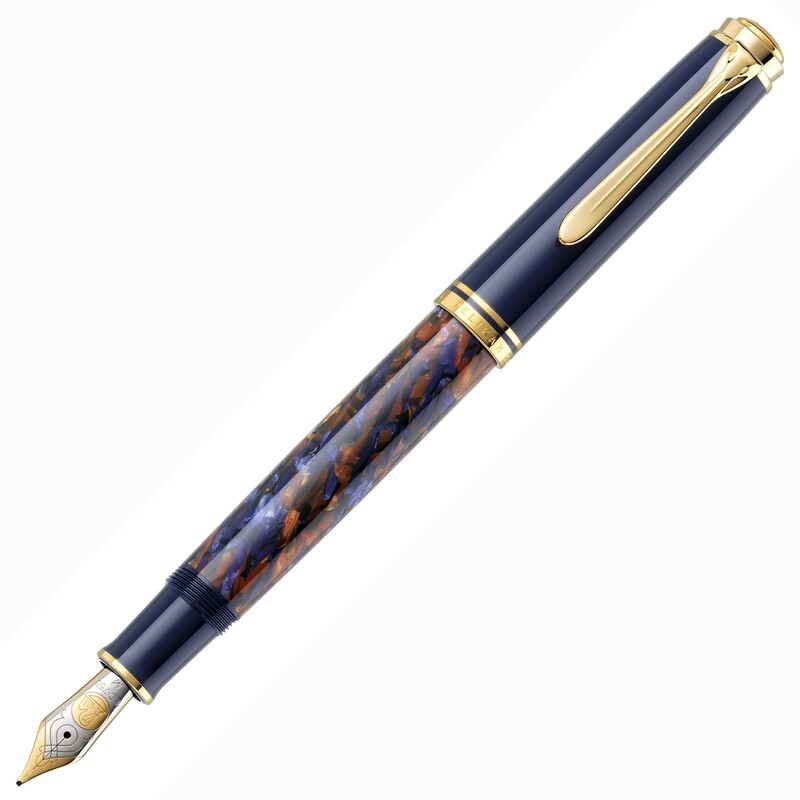 Are you familiar with the Aspen edition of the Shaeffer Balance II pen? Bexley also had an Aspen edition of their Submariner Grande. The Stone Garden looks very similar, at least from the photos. I hope so, my Aspens are my favorite pens. I have seen pics of the Aspen in the past and agree that the color scheme here is certainly reminiscent. Once again, a great preview Josh. Since I just picked up two pens in Europe just a few weeks ago i think I need to give it a rest.. it’s a beauty but doesn’t call to me the same way the red stripe or ocean swirl did. The Red Stripe is one of my favorites. I think you did well to come home with those two. Your comment about the nibs is well taken and this has been point of contention for years. The nib line up works for them from a financial and sales model I’m sure but doesn’t do much for the enthusiast. I think we’re just too small of a market to cater to. Have you tried to get a few of those nibs custom ground? I was against it for a long time but, like you, got tired of the same old line. Really makes for a refreshing change for not too much of an extra cost. I find it amusing/interesting to find an ink that best matches the Pelikan I am using. For example, I always fill my 800 Blue striated pen with Iroshizuku Asa-Gao (“morning glory”) ink. With this gorgeous new pen, however, a darker blue would probably suit it best. My immediate thoughts are Diamine Bilberry or Iroshizuku Shin-Kai (“deep sea”) ink. What do others think of this? I use several iroshizuku inks indeed one if my favourites is asa-gao but I also like kon-peki. I use Diamond inks too including Bilberry. Diamine works really well in my ‘wet’ writers such as Pelikan. Have a look at their ‘Majestic Blue’ or ‘Sargasso Sea’. When writing letters (rather than doing my own admin) I try to match the colour to the recipient which is always fun, blue doesn’t suit everyone. I like that philosophy, matching the color to the recipient. Makes it just a little bit more personal. I’ve never been big on matching inks with pens, mostly because I’m limited in what colors I can get away with. I know that for the Stone Garden, Pelikan themselves are suggesting that it be paired with the Edelstein Sapphire ink. I don’t have a choice here – I have to buy it. And in fact, just reserved it at LCDC since there was that awesome coupon code. I actually bought and sold the Ocean Swirl twice before I understood turquoise is not for me. And as much as I love the recent M815, it’s just a bit too close to the Stresseman for my personal taste. But this I can’t pass up. Here’s hoping it’s as beautiful as it looks here! “I don’t have a choice here…” That’s the way I feel with nearly every release. Sorry that the Ocean Swirl wasn’t your cup of tea but glad that you finally figured it out. Hopefully the Stone Garden will be much more to your liking. I also agree that the Stresemann, the Metal Striped, and even the Raden Royal Platinum are just variations on the same theme. It’s a nice theme but to come out so close to one another seems overdone. Has Pelikan indicated whether or not the barrel will be translucent enough to offer a glimpse of the ink level? They have not indicated as such explicitly but all indicators suggest that it is, particularly since we’ve already seen the same in the M320. My apologies. I was originally commenting on the M600 Vibrant Orange. As for the Stone Garden, I don’t think there will be much in the way of translucency or an ink view. Will have to wait to see what it delivers but I don’t anticipate anything of that sort here. Thank you Joshua. I hoped something definitive had issued from Hanover in the two weeks since you posted the announcement. If the orange M320 is typical of that line, it looks almost like a dressed up demonstrator. I hope for some visibility for strictly practical purposes (“I’m a user, not a collector.”), but in fact it’s a moot question. The LCdC weekend sale was persuasive. How mysterious, that a mere pen can be so captivating. Perhaps an explanation could begin with what the mighty pen can do, the technical virtuosity with which especially the Pelikan fountain pen accomplishes it, and the beauty and dignity they (usually) bring to the task. This one could have been more aptly named however. It seems to me less reminiscent of a stone garden than of an fall hued aurora borealis. You’re welcome. Yes, I’m not sure of any stone garden that looks like the M800. Perhaps I just don’t have the imagination for it. Thanks for the correction, and for the Orange M600 review. I was wondering if that might be the case. Many of Pelikan’s birds without a discrete ink window are able to pull this off. More than enough for me but some really miss the window. Regardless of what it ends up being, I’ll be happy to add this one to the flock. In the suggestion box I politely insert a mention of the usefulness of being able to edit after posting in haste. Ha. I don’t disagree. That’s a WordPress issue though and totally out of my control. I can make small edits on the back end though if need be. ‘…a fall-hued aurora borealis.’ Re. the ‘Stone Garden,’ my imagination fails me too. It looks like a tough one to capture in photos but I’m looking forward to seeing it in real life. Thanks for sharing the link. Hopefully FPN is running a bit smoother these days. I too look forward to meeting the pen in person. The noble effort of Fritz Schimpf notwithstanding, the photos are not altogether impressive. I.e., I’m sure the pen will have even more to be admired than the likely hurried photos were able to render. Fritz-Schimpf got real world photos of the Vibrant Orange and Stone Garden out very quickly which I appreciate. Still, seeing is believing and I know that these pens are incredibly hard to photograph. My Stone Garden is in the mail and hopefully the Vibrant Orange will be close behind. Perhaps I’ll do a review of this one since it’s something different. My Stone Garden arrived this morning and I’m afraid I feel disappointed and let down – particularly after the Metal Striped and Platinum. The barrel colours appear to be formed by a spiral of the striated material that we normally see as straight lines within the barrel. There is some apparent ‘depth’ in the barrel material I grant you, but overall the colours look dull – I don’t know how PenWorld have managed to take such bright pictures for their Instagram site. It is difficult to see ink level or piston through the barrel. Oh well I suppose 2 out of 3 isn’t bad – but I think my flock will probably not grow bigger if this is the best Pelikan can do! I’m sorry to hear that it’s not quite up to your expectations. The M815 and M805 that you describe are different animals and I can see how the M800 might pale in comparison. Blue resin is just a fancy word for plastic so you’re correct on that front. I did not expect any transparency on this one so I’m not surprise that it would be difficult to gauge the ink level. If you are truly unsatisfied, I hope that you are still able to return it for a refund. I’ll be curious to see how well these sell. I suspect the Vibrant Orange may ultimately prove to move a lot better. Have you seen this yet? Is it worth purchasing? I should have eyes on it tomorrow. It was delivered a few days ago but I’ve been away. I’ve seen many real world pics by now and do think it worth purchasing if it appeals to you. Whether it’s worth it or not though is a very subjective assessment. I love the M800 line and this is a more unique finish in that line-up which makes it a no brainer for me. Plus, I love blue pens. I know the pattern on the barrel doesn’t appeal to everyone. Only you can decide if it’s worth purchasing but I can say that I’m not disappointed based on what I’ve seen thus far. I do hope to have a review of this one up soon. Very much looking forward to your review.